New Ellenton Hickory is a caramel colored floor. The 7 mm wood grain boards create an incredibly realistic look of hickory hardwood flooring while providing the strength and durability of laminate. This TrafficMASTER product is guaranteed for everyday household wear and tear and is designed for easy angle tap installation. The floor is a floating system that does not require glue or nailing: it can be installed directly over most existing floors. TrafficMASTER New Ellenton Hickory achieves the look of costly real wood with the ease of worry free installation and care. 26.8 sq. ft. per case. Case quantity: 10. Case weight is 32 lb. 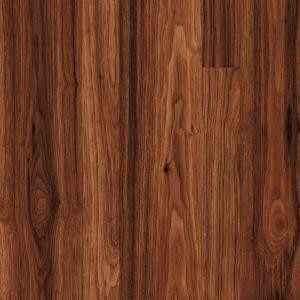 Buy online TrafficMASTER New Ellenton Hickory 7 mm Thick x 7-9/16 in. Wide x 50-3/4 in. Length Laminate Flooring (26.80 sq. ft. / case) 0352CJI3409WG11, leave review and share Your friends.